We now have the names and roles of the 911 Conspirators. A significant number of these men are starting to have substantial worries about being exposed and brought to justice since this truth is rapidly diffusing to the American Masses. The Top Perps are now taking major diversionary actions which include more False-Flags. These reckless actions are actually speeding up the very process of public discovery of who did the Attack on America on 9-11-01 which these Perps are trying desperately to prevent. We now have the secret Able Danger Report and the AEC Sandia Labs Report which lists all the Perps responsible for planning, deploying and covering up the attack on America on 9-11-01 which was nuclear. The 9-11-01 Perps were so frightened of this Able Danger investigation that Rumsfeld and Blackjack lured them to the special newly reinforced Naval Intel Section of the Pentagon on the morning of 9-11-01 for an emergency meeting. Yes, in a sense it was an emergency, but only for the 9-11-01 planners. The Able Danger investigators had been discovering too much information on how Israel stole 350 nuclear Pitts out the back door at Pentax in Texas, where they had taken them and what they were planning on doing with them for False-Flag terror and Samson Option installments on the nations of the World, including America. But the actual reason for the meeting was to lure them to certain assassination to keep from being discovered for their impending espionage and Treason set to begin that very morning. Once they arrived and were securely positioned in a special designated meeting room, they were assassinated with a cruise missile accompanied by a large conventional jet that did a flyby over the Pentagon right before to confuse witnesses. In this Pentagon attack, 38 of the 50 Able Danger investigators were killed, and the others were not there. Colonel Anthony Shaeffer was missing that terrible day, but he has not been willing or able to come clean in the CMMM, especially Fox news where he has been a frequent guest, or just never got the whole Able Danger finding before most of them were murdered. He may have been kept away from the main part of the investigation by the Perps. Perhaps Colonel Schaeffer is concerned of having the full 9-11-01 coverup mechanism brought down on him to speak out and fully disclose what he knows, or the fact that his secrecy clearance has been removed perhaps intimidating him to keep silent about the specifics he is aware of about the Perps of 9-11-01. Yes, maybe Colonel Schaeffer doesn’t know the whole story that some Able Danger Investigators were tracking nuclear Pitts stolen out the back door at Pantex in Texas, taken to Israel to be reprocessed, brought back to America and then stored in near NYC at Fort Lee. It is pretty obvious that any individual who would ever get deeply involved in the planning, deployment and cover up of this mass-murder event used to create a false pretense to trick Americans into fighting illegal, Unconstitutional, unprovoked, undeclared, unwinnable, perpetual wars in the Mideast, secretly for Israel, would have to be a psychopath (newer term used for this is sociopath). Most of these 9-11-01 Perps are remarkably Two-faced. Some psychiatric and psychological researchers have claimed that individuals with these personality disorders may have frontal lobe damage, or may just lack any ability to empathize with other humans, an essential trait necessary for being a part of any community, an essential human trait. One would think that this type of psychiatric or Psychological disorder (as listed in all the DSM manuals, including the new and largely disrespected DSM V) would make it fairly difficult for any such individual to be able to be a sustaining part of a marriage and a family. yes, these individuals have notably high rates of marital infidelity which should not be surprising. However a true sociopath either ends up in jail at an early age or if intelligent enough rises up to be a CEO of a major corporation. The most intelligent sociopaths are often very successful financially and this often draws women who are gold-diggers, of which a significant portion are themselves sociopathic types, even if in normal ranges and not prone to criminal or anti-social like their husbands are. being a gold-digger can provide strong motivation to put up with a very rich and successful husband dalliances where he occasionally get caught and can give such a wife more power to get some new clothes or personal desires for consumer excesses met. These very intelligent “pure” sociopaths that become industry moguls and CEOs of a large lucrative Corporations do have a trait which provides their ability to be able to do their secret sociopathic acts, like serial infidelities, sometimes even cheating on their main mistress with a high priced call girl or another mistress. This protective trait is the instinctive ability to anticipate how to avoid getting caught or exposed in the public arena or how to fix problems before they get out of control. This self-protective trait requires an ability to exercise some strong paranoid type thinking trends and the ability to almost instinctively anticipate how they could get caught and to pre-emptively make defensive moves or changes which will assure disclosure. Of course this trait is motivated by the sociopath’s deep down internal fear of losing one’s wealth, power and public status and persona or fame. When the sociopathic top achiever feels exposure may come, this fear motivates them to do desperate acts of evil to prevent it and sometimes they exhibit poor judgement in doing this and this precipitates their very exposure. So it seems that the very moment they experience this intense fear of loss of wealth, power and public status, the high level of fear they feel deep down inside clouds their usual astute judgement and impairs their ability to effectively run a coverup that would work. Are these *WZ/OCC Perps reacting to the quickly diffusing truth of their part in 9-11-01 by staging and deploying diversionary False-flags to draw the attention of the American Masses away from 9-11-01? Instead these top Perps often overreact and make dumb, absurd or extreme corrections by going to far and going too far in their efforts to deploy a new distraction to enhance their coverup. This overreaction is like swatting a fly with a sledge-hammer and this often draws attention to them and the public starts doing some deep research on the Internet and finds many have already published what these sociopaths have been doing published on the alternative media websites such as veterans Today. Now we discuss what the 9-11-01 Perps biggest fears are, how they have overreacted and what is perhaps on the horizon that is going to come at them and bring them to justice or drive them from America. Part II: The effects of the Perps acute fear of being discovered, fingered as this information diffused to the masses via the Worldwide Internet and how they instinctively know that the World may come for them in many different possible ways. We know that these Perps have become increasingly fearful, although this is covered up by tremendous hubris and a false sense of bravado and also numerous increasingly desperate acts to create distractions and cover and new cause celebres to motivate the masses to believe in their False-narratives and Big Government Lies. They know deep down inside that every day more and more of the masses are learning who they are and what they did on 9-11-01 and they also know that if they don’t finish their take-down of America fairly soon it will be over for them. They have a good idea of how the masses can get them but may not fully understand all the specifics. They have detailed studies by their own social and political scientists and Alphabet LE specialists on domestic terrorism and potential domestic terrorism. Most of their experts are notably wrong because they do not understand or appreciate the strength of the human will or the power of the worldwide Internet to elicit a new incredibly powerful Populism which is going to be their greatest enemy possible and one they cannot yet fathom or imagine. We will list what they have done as over-reaction and attempts to regain control over the masses. Then we will explain how they can be defeated and why it is likely too late for them and they should really leave our great Republic America now in peace and with their offshore staches of cash intact while they still can. Overreactions by the 911 Perps enacted as False-Flags, designed to distract the masses away from the truth about 9-11-01 which is being diffused to the Masses by 9-11-01 researchers at the speed of light on the Worldwide Internet. Astute covert researchers have figured out that these Perps have deployed a plethora new coverup “distraction” ops in reaction to the public unraveling of their 911 covert op in the hope that this will realign the American masses and others around the World to create mass public support their Establishment and Big USG Lies and false narratives. The 7/7 London Bombing, a false-flag attack. The March 11, 2004 Madrid train Bombing (known as the 11-M bombing). Sandy Hoax. A FEMA/DHS Capstone Drill run by the first essential all synthetic DHS assembled community. It’s easy to produce fake, synthetic, virtual mass shooting when the whole community including the local police, firemen and State Police and Governor are in on it. The Chris Kyle murder and movie to distract and make 250 million. Was it an MK-Ultra dupe used or is there even a remote chance Kyle is still alive and his death was faked. Gordon Duff has stated he thinks he was becoming an embarrassment. For example he stated that he had shot numerous Katrina victims as a sniper in new Orleans, a comment which creates anger toward FEMA and he lied about “knocking” former Minnesota Governor Jesse Ventura out in a Navy Seal bar in California, and his testimony was collapsing. After his death, Jesse won a 1.75 Million dollar award against his estate for the lie. The False-flag in Argentina in which the OCC used the Mossad to murdered a prosecutor and then planted false evidence incorrectly linking the President of Argentina to this murder. All this done because President Cristina Kirchner of Argentina ordered all Israeli-Argentine Dual Citizens out of Argentina. The buildup of ISIL/ISIS/Daish using OCC Cutouts like Senator McCain, and American Generals McInerney and Vallely and a large portion of the Bush Crime cabal controlled CIA and American, Israeli and Saudi mercenary forces. ISIL/ISIS/Daish is basically a construct of the Khazarian Neo-Bolshevik Mafia part of the OCC, you know, the current Likudist leaders of Israel. The Charlie Hebdo False-flag “mass-shooting” in Paris. Currently under investigation on the ground by VT. So far we have no conclusive results if there were actually any dead victims, except that the so-called shooting victim on the sidewalk was shot with blanks. The ISIL/ISIS/Daish beheadings of captured journalists and others. Currently under investigation by VT as to whether any were real. We already know some were filmed in Israeli with very state of the art video sets, use of green screens and very expensive video equipment. We also know that many of the ISIL wounded have been taken to Israel for treatment. The Disneyland Measles False-Flag which is a great distraction but also has the dual purpose of serving as a big manipulation to scare the American public into submitting their children to poisonous vaccines which also contain covert population and mind-kontrol substances. Burngate, the apparent ISIS burning alive of a captures Lebanese Pilot. This is televised pure, primal terror at its best designed to scare the sh*t out of the masses and motivate them to support another ground war for the Israelis and the OCC to destroy Syria and Iran as independent nation-states. Part II: Here we will discuss what actions American may take against them as this truth of “who done it” diffuses and spreads to mainstream America. Here is a list of what can go wrong for the Perps if too many of the American Public come to believe that the 9-11-01 attack on America was nuclear and who the specific persons are that did it and how. Oblique knowledge that each of these is a real possibility is now severely stressing the Perps. The activation some very tough former special op or mercenary loners who lost family member on 9-11-01, are having a tough time surviving in this tough economy and actually no longer have any vested interest or anything to lose which makes them very, very tough potential enemies of these Perps when they find out. Despite efforts to track and control these men, many are out there and if they decide to engage in wetwork independently, these men can certainly attain their objectives. This means secret assassinations set up to look like accidents, illnesses or suicides. Same as in #1 but involving special ops, mercenaries and wet boys that come to their senses, figure out they have been used to help asset strip and destroy of America. Obviously any of these “lone wolves” are far too resourceful to be stopped if they decide to act alone using their deep black covert skills. Either #1 or #2 may have already occurred in some cases of peripheral players or aides of the Perps as warnings to the Perps (perhaps Bankers in this case). The spontaneous rising up of the masses as the US economy continues to recede, certainly partly a response to the new BRICS Development Bank (backed by Gold, Silver and real commodities not fake Fiat Counterfeit “money”). This would involve urban rioting, burning and sniper attacks on police for their brutality after years of pent up rage. As the Police, military, DHS and Blackwater type mercenaries crack down and go door to door to confiscate and steal guns and art work like they did in Katrina with the same murders of innocent men, women and children, this would result and civilians to proactively shoot first with high powered deer rifles and shotguns. The bloodletting would get severe and at that point many of the Police, military, and DHS would turn on their officers and superiors and shoot them and join the Citizens. There are numerous individuals who know who the 9-11-01 Perps are and have been angry at them for years. These men would use that rioting as cover and an opportunity to administer instant payback by assassinating their choice of the 9-11-01 Perps they can get to and any local OCC collaborators. As soon as the average deer hunter or hunter sees this Police, DHA crackdown as a new Revolutionary War of We The People against the Redcoats, the civic response best referred to as the Solzenitzen Solution will be massive and overwhelming. At the point the bodyguards assigned to protect the OCC Kingpins and 9-11-01 Perps, many of those bodyguards will either abandon them and go YOYO (you are on your own, going home to protect their own family) and some will whack out these Perps for ordering the crackdown and mass-murders of the American Masses. Head shots from behind will be used in many cases, best called “surprise shots.” Once it’s on, the American fighter will be unmatched for ingeniousness and resourcefulness. When your armed American is furious with the Perps and has nothing left to lose because the Perps asset stripped it all, there will be hell to pay and it is likely all Perps will be assassinated in due time. A critical mass turning point is reached by the masses. 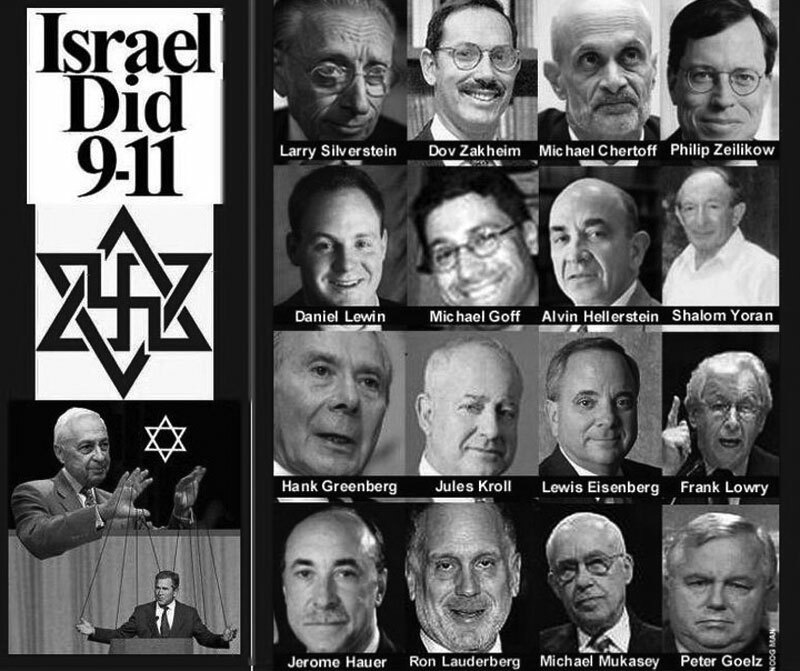 Experts have claimed that a major turning point will occur when 12% of the American People have woken up and understand that the attack on America on 9-11-01 was done by Israelis with the help of American traitors in the Administration, Congress, the JCS, NORAD and the FAA who committed Treason, Sedition and Criminal and Civil RICO on that terrible day. As this critical mass turning point is reached, mass demonstrations occur and the American masses bring the Federal and State Government to a standstill. As the authorities try to strong arm the protestors, Civil War breaks out and many who are employed to serve as establishment and OCC protectors will break ranks and almost every single stateside 9-11-01 Perp will be hit. The US Military changes sides quickly and join We The People. Perps will be shot on site and any OCC Kingpin or Cutout who is recognized. The High Military Command has had enough and suddenly deploys the Provost Martials backed up by SOCOM groups to go out and arrest all OCC members in Congress and Israeli espionage front members serving as Israeli espionage agents, and all 9-11-01 Perps. Quick Militarily Tribunal Trials are held for Treason, Sedition and Espionage and many are convicted and hanged. Some who see this coming will provide secret testimony will be given immunity agreements and short sentences and will be rehabilitated. A renegade “Seven Days in May” strike force set up by disgruntled folks in the High Military Command or were in the High Military command or who run certain deep black unacknowledged SOG groups that are off the books. Due to some grudges for past unresolved issues coupled with the fact that these commanders wake up and understand how the WZ/OCC has infiltrated and hijacked America and is destroying it and decide to take out the OCC principals here in America using all the available Intel, names, addresses, where they work or have offices, etc. US Space War Naval Division Commanders take control and violate their treaty to stay out of politics and decides to fully deploy their ultra high tech weaponry and anti-gravity craft arsenal to deliver a crushing blow to the WZ/OCC all over the World with incredibly strategic strikes and the ability to disable to Israelis Samson Option planted nukes. The US Navy never forgives and never forgets, especially the WZ/OCC attack on the Pentagon Naval Intel Section on 9-11-01. A sub commander is able to disable the ultra top secret explosive charges which automatically detonate set off on unauthorized missile hatches and launches everything at OCC/WZ sites. Or a carrier commander deploys his full arsenal against the WZ/OCCs after communicating a very plausible cover story which is instantly accepted by his men.Once this starts the whole US Navy joins in. The Russian Republic and China feel that the WZ/OCC has pushed too far and unleash everything they have including Secret Space War weaponry, all of it somewhat superior to everything we have. The attack is very surgical and all WZ/OCC strongholds are eliminated. A negotiated truce is made and what is left of the US Military which is substantial, agrees to the conditions that all WZ/OCCs be tracked down and either KIA or arrested for instant trial by a military Tribunal. There is one unspeakable possibility related to Secret Space War that cannot be discussed at this time. Suffice it to be described as a large strategically and surgically targeted “Reset” which will eliminate any 9-11-01 Perps and all major WZ/OCC Perps who have not turned away and gone straight (that will be most unfortunately). *WZ stands for World Zionists based in the City of London who use the Israel International Zionist Crime Syndicate (IZCS) and the Bush Crime Cabal (BCC) as their main action-agents to do their dirty work. The IZCS and the BCC have become joined at the hip and work form the WZ/OCC (World Zionist Organized crime Cabal). Lately the BCC has worked out a special deal to make sure that the IZCS is blamed for 9-11-01 and cut-loose and destroyed by the WZs, a very crafty move which may backfire and result in both the BCC and the IZCS collapsing along with the WZs. There is another force on the horizon few know about which may then move into power. All contemporary Terrorism is a very large Organized Crime problem, nothing else.